A new poll has shown that 38 percent of Americans hold an unfavorable opinion of Chuck Hagel as secretary of defense. A new poll has shown that 38 percent of Americans have an unfavorable opinion of Chuck Hagel as President Barack Obama's nominee for secretary of defense. 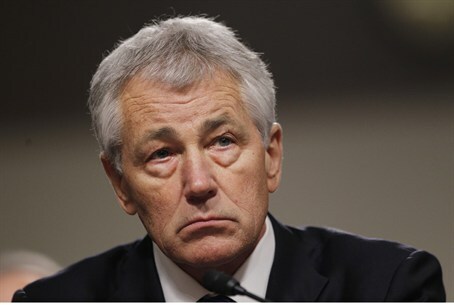 The poll, conducted by Rasmussen Reports during the month of February, showed that, in contrast, only 28 percent of Americans held a favorable view of Hagel, while over one-third of Americans, 35 percent, believed that they lack sufficient knowledge to render an opinion. "Additionally, Hagel has refused reasonable requests to disclose his sources of funding, raising questions as to what he is hiding and sowing doubt as to his judgment and suitability for his proposed role. "We strongly urge other organizations to not only express concern about Hagel, but to explicitly oppose his confirmation," added Klein. Recently, the Anti-Defamation League (ADL) and the American Jewish Committee, (AJC), both of which are known to be liberal-leaning organization, added their names to the long list of organizations and individuals who have expressed opposition to the Hagel nomination and have called on the former senator from Nebraska to clarify his numerous, troublesome anti-Israel remarks. On Wednesday Sen. Chuck Schumer (D-NY) stirred debate after he claimed that Hagel “almost had tears in his eyes” as he explained to the former Nebraska senator that the expression “Jewish lobby” is rooted in a negative depiction of Jews.